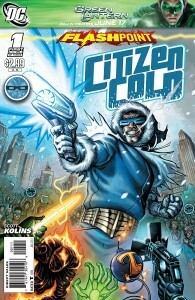 Citizen Cold #1 is the first in a three-issue Flashpoint series, written and drawn by longtime Flash artist Scott Kolins. I’m happy to report that it doesn’t disappoint, finding it a well-written and fun story and looking forward to the future issues. Citizen Cold is what passes for a hero in Central City, although given the dark hints we’ve seen in other parts of the Flashpoint world, his harsh methods don’t seem particularly unusual. He also drinks and womanizes too much, which is perfectly in line with his regular-universe behaviour. In fact, his behaviour is fairly similar between the two universes, suggesting that whatever Professor Zoom did to the timeline, it didn’t affect Cold too much. Since he still has the abusive father here, it strongly suggests that his terrible upbringing affected him a lot more in both universes than the presence of the Flash or other Rogues. Things played out similarly for Cold in the Flashpoint universe as in the regular one, only here we get a more explicit reminder of one of the crueler things he’s done: leaving his sister Lisa at home with their abusive father. This was brought up during Geoff Johns’ run on The Flash, although in this reality Lisa never escaped by becoming a professional skater or villain, and eventually kills her father out of desperation. It seems especially callous on Cold’s part because here he’s rich and famous and could have easily rescued her, and really emphasizes what a selfish jerk he is. I’d like to hear his rationalization (if any) for it in a future issue. While we don’t see much of the other Rogues, they’re a lot of fun. Axel is hilariously obnoxious and irritates everyone around him, and I’ll never be able to stop chuckling at Weather Wizard’s goatee. But I hope we find out hints of the life choices which led to them becoming who they are; for instance, since Weather Wizard never killed his brother, why did he still become the Weather Wizard? Was James Jesse around and Axel then took the mantle from him, or did Axel become the Trickster (ahem, ‘Trixter’) all on his own? The same question applies to Evan McCulloch and his predecessor. It does seem a bit too coincidental that many of the current regular-universe Rogues are also around and working together in the Flashpoint world, which is arguably a plot flaw but perhaps future issues will tell. At least including non-Rogues like Fallout helps keep the lineups from being too similar. One point of interest is that we learn the name of Cold’s father for the first time: Lawrence (I’ll assume it’s the same between the Flashpoint and regular universe). This is helpful, because for lack of anything else I’ve been calling him ‘Daddy Snart’ or ‘Old Man Snart’ for years! The art is what we usually expect from Kolins; slightly cartoony but very detailed and distinct. He draws the Rogues so often that they look very familiar to Flash fans, and I like that. The colours are slightly dark and muddy to my eye, however, and could really stand to be lightened. In some panels it’s difficult to figure out what’s going on. And as an aside, there’s a lettering oddity in the first few pages of the book: emphasized words are underlined rather than bolded, and I don’t think I’ve seen that anywhere else. It’s jarring because it’s unusual, but fortunately only a few pages are like that. The issue is definitely worth picking up, and one of the more enjoyable Flashverse stories in quite a while (it’s a bit of a shame we had to go into an alternate universe to get it). Hopefully the next two issues will be as good as this one. This entry was posted in Reviews and tagged Captain Cold, Citizen Cold, Flashpoint, Iris West, Rogues, Scott Kolins on June 10, 2011 by Lia. How come Suicide Squad instead of a Rogues title? C’mon, the Rogues are busting to get out! Won’t find an argument here! I was hoping they’d announce a Rogues title, however unlikely. Didi anyone else think the guy in the green outfit was the Pied Piper before it was revealed to be Wally? I think Kolins art was pretty spectacular, too and felt the darker coloring emphasized the mood of the world. It looks like Wally is Piper. The logo on his phone, all the green, and the room full of musical instruments. The only other explanation is they are roommates and Wally is borrowing Piper’s car because his van was ruined. 1. Wally’s working with Hartley, and Hartley’s the Piper in this reality as well. 2. Wally’s the Piper in this reality, and this is how he ends up with the cybernetic voicebox. Well, in FP 1, Piper’s still gay, so I’m assuming that Hartley is still the Piper in this timeline, and is working alongside Wally. oh thanks for that one! no comment to how Wally ends up in the last panel? Well, we’ve seen people recover from being frozen by Cold’s gun in the main timeline, so I wouldn’t count him out yet. And there’s a strong implication that he’s the Pied Piper in this reality, in which case he’ll make a partial recovery before getting help from Cyborg. And it’s an interesting reflection of last week’s Flashpoint #2 final panel, with Barry burned to a crisp, isn’t it? definitely. i totally spaced on Piper in FP#1. Seeing his head frozen in that last panel… shock i guess. lol. I gotta quit reading this site for awhile! This has definitely been my favorite issue of a Flashpoint series so far, in terms of just being an entertaining read. The others I’ve read have been interesting in terms of exploring what’s different about the Flashpoint timeline, but this one? It felt like a return to the glory days of the Johns/Kolins run. It’s also the first comic in probably months that’s left me wanting to read the next issue NOW — and yes, I have read Flashpoint #1 and #2. Totally agreed. After this, I’d love to see Kolins on a Flash spinoff title of some sort. Central City, home of the Flash. The Rogues, the Flash’s enemies. Either Zoom has a soft spot for the place, or he had to tread lightly in order to keep Barry intact enough to taunt. It could also be seen as Zoom’s way of screwing with the Rogues. They no longer have to worry about the Flash, but their greatest foe is the man who should be their leader. As it is, Zoom still gets to screw around with Barry’s loved ones — Wally — and, even better the Rogues are doing it for him. Yeah, you’d think he be fairly happy to mess with the Rogues considering the enmity between them. I guess it’s possible he has a specific plan in mind which needs them this way, although it’d be funny if leaving the Rogues largely intact turns out to be his undoing. I didn’t see any pipes in Wally’s lair; I think it’s just as possible that he might be Flashpoint Fiddler, or even Flashpoint Music Meister, as it is that he is Flashpoint Piper. Pied Piper was not the first Flash villain to wear green and be musically themed. Ah, but on their next meeting, will he settle the score? This does explain why Geoff Johns was so hush hush about Wally’s role in Flashpoint – it would have spoiled the last page reveal here. Not if he’d simply said, “Wally will appear in the Citizen Cold miniseries” and left it at that.